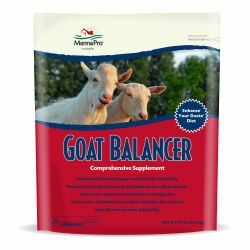 Comprehensive supplement to boost and balance goat diets. Contains quality ingredients to boost and balance all types of goat diets. Helps meet the needs for growth, milk production, reproduction, and show appearance. Highly palatable formula helps promote feed intake. High Quality Ingredients: Anise flavor to promote palatability, Yeast culture to support feed utilization and digestive function, Brewer’s yeast to support optimal digestion., Yucca to improve feed intake, Sea kelp, diatomaceous earth, and ammonium chloride. Complete mineral and vitamin package. *The enclosed scoop holds approximately 1 ounce of Goat Balancer by weight. DO NOT feed any product that is spoiled, moldy, rodent or insect infested, or abnormal in appearance or odor, as it may cause illness or death. This product contains supplement copper. DO NOT feed to sheep or other copper-sensitive species. Dehydrated alfalfa meal, corn distillers dried grains with solubles, soybean meal, wheat middlings, feeding oatmeal, linseed meal, vegetable oil, cane molasses, dried whey, hominy feed, calcium carbonate, monocalcium phosphate, dicalcium phosphate, salt, ammonium chloride, yeast culture, hydrolized yeast, diatomaceous earth, dried kelp, anise oil, yucca schidigera extract, potassium chloride, magnesium oxide, sulfur, ferrous sulfate, ferrous carbonate, copper sulfate, copper amino acid chelate, manganous oxide, manganese sulfate, manganese amino acid chelate, zinc oxide, zinc sulfate, zinc amino acid chelate, calcium iodate, cobalt carbonate, sodium selenite, vitamin A supplement, vitamin D3 supplement, vitamin E supplement, thiamin mononitrate, niacin supplement, riboflavin supplement, calcium pantothenate, pyridoxine hydrochloride, vitamin B12 supplement, folic acid, biotin, ascorbic acid, active dry yeast, dried aspergillus oryzae fermentation solubles, dried bacillus amyloiquefaciens fermentation solubles, dried enterococcus faecium fermentation product, dried lactobacillus casei fermentation product, dried lactobacillus plantarum fermentation product, propionic acid (a preservative).